EPA: No Fuel Economy For You! - Cars! Cars! Cars! EPA: No Fuel Economy For You! Well, less fuel economy. But you already knew that. The EPA's method... "method" for testing... "testing" vehicles for fuel economy was about as good our "method" for proof-raeding. The Car Connection reports: EPA Launches New Mileage Numbers. reports: New MPG Figures Coming. While we applaud the newer tests, we're a bit worried that buyers will be confused while shopping next year, when both stickers will be used simultaneously. Our best advice would be to look for these words at the top of the new sticker, shown above: "These estimates reflect new EPA methods beginning with 2008 models." What? Two sets of stickers?! Why does the EPA constantly have to piss us off? 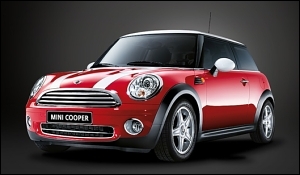 Meanwhile, Autoblog reports: MINI touting 40 mpg for new model. The thing, these are for 07s, so what are we talkin' for 2008? That's a snap of the 2007 Mini Cooper. When we finally get a date with Alison we'll be picking her up in a Mini.